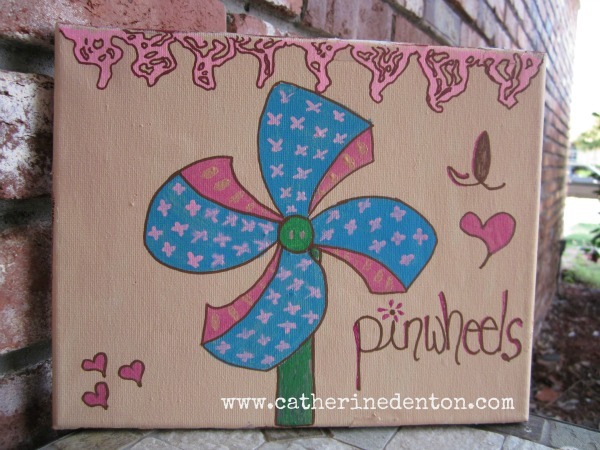 This post is full of pinwheel thoughts whirring around in my mind. I Miss Having a Blog List. I used to have a beautiful blog list of all the blogs I follow sitting on the sidebar. I follow a LOT of blogs. I'm not ashamed of this; it fills my Google Reader full of goodness. And used to, I would see all that goodness throughout the day when I'd check on my blog. I could click on the pretty pictures and hop to the newest posts. It helped me visit loads more blogs. BUT, I started getting Malware warnings on my blog due to being linked to some blogs that had been put in harm's way. The only way to stop it was to take the links off my blog. At first I tried just deleting the links that were a problem. But it kept happening and I KEPT having to delete links. I don't want someone to hop to my blog only to find a Malware warning. If I were them, I might not return to what could be perceived as a dangerous site. So finally I relented and took the blog list off. I've missed it so much. I still check my Google Reader but it's just not as convenient. Have any of you struggled with this? Maybe it was my monster of a list. Turning My Artwork in a (little bit) of a New Direction. I've had a niggling to do a few things different in my art. I've always wanted the addition of words since I've always adored doodling words and letters. It was kind of an obsession growing up. So lately my backgrounds have become more serene and simple while the subject has taken a more prominent place along with words. It's been invigorating to try something different and see where it goes. I've been thinking about doing a question and answer post. If any of you have a question (on art, blogging, or whatever), leave it in the comments below and maybe I'll make a post about them. 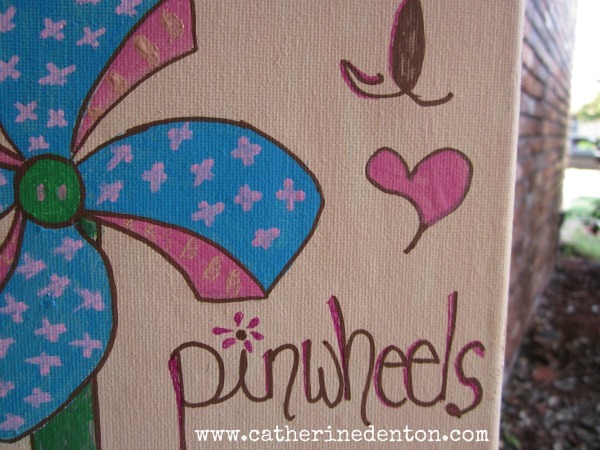 What things are pinwheeling around in your mind today? I don't use bloglovin' like I probably should. Windsurfing sounds incredible! I'm sort of obsessed with google reader, where I have things organized by folder like a crazy person, so I've never had a blog list! I'm sorry you miss it. I like paintings with words. 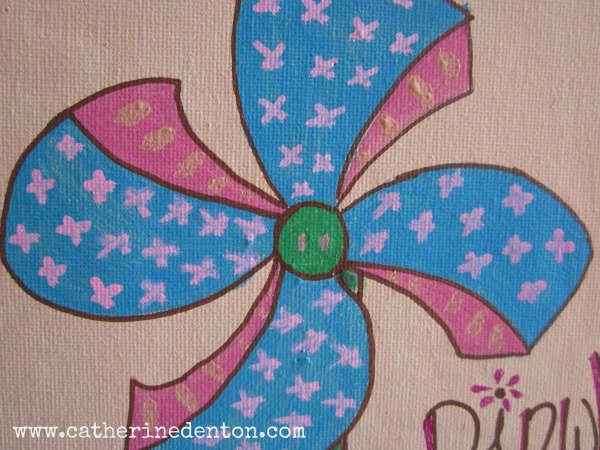 And I like pinwheels :) Yay. Your pinwheel is beautiful, dahling! I am laughing so hard right now, Beckie. You're adorable. I'm glad you thought of your word. I do read blogs in the blogger dashboard most time. Guess I think of the reader because it's connected to Google Reader. What to you do to prepare for painting time...do you just start right off the bat or do you have some sort of ritual you go through to begin? Cat, that's such a good question. Every once in a while I'll start painting and see where it takes me but I'm doing that less of that nowadays. Usually I start by note-taking what I want in the piece and collect colors for it. The only ritual I can think of is cleaning off my art table before I begin. Just the act of touching all that paint and scraps of paper gets my creativity flowing; not to mention the clean area to work in! Sorry you miss your bloglist, but at least you solved your malware problem. I think it's great that you're branching out in your art. I've been doing that, too, with different media (haha, nothing wildly innovative -- just pencil and pen). I find their lettering inspiring. Thanks Bridget, I will! I adore seeing how people do lettering. Does Traci have a book? Her name sounds familiar... I'll see. Folders in Google Reader? There's an idea! I dropped a few blogs from my list when I received a warning. Not exactly sure how it would come back to me, but better safe than sorry. I've been missing from both tending to my own blog posts AND reading my favorites of late! I rely, greatly, on email notification when my favorites (such as YOU, Catherine) post. I LOVE words in the written form! That said, the incorporation of words in your artwork is a beautiful idea. I can't wait to see what you do with it!